Last weekend I travelled to the Gold Coast for my final two races of the 2016/17 Australian Season with my coach Steve O’Brien and my Fuse team mate Sarah Short. The opportunity to race with one of my closest team mates in the Luke Harrop Memorial in our final race of the season was amazing. On Saturday, I had the Commonwealth Games Trial event of the Mixed Team Relay. Each team included 4 athletes who each had to complete a 250 m swim, 7 km bike and a 1.5 km run into transition and tag their team member out for their turn. I never knew something so short could be so painful. But it was a privilege to race on the same course (slightly shorter) as the WTS athletes, which were due to compete later that afternoon. The remainder of Saturday was resting up for Sunday's race, which was the Luke Harrop Memorial Sprint Distance Triathlon. Sunday morning was an early start to set up transition and get ready for a 7.41 am wave start. The Open Female event had a strong field of entries, including Sarah Crowley, Felicity Sheedy-Ryan and Kira Hedgeland. Nevertheless, I was excited to see what I could do with the opportunity to perform and race with some outstanding athletes. With the swim, I started slightly to the right (upstream) of the first buoy. Perfect. We started ankle deep in water, which meant swimming pretty much from the start. The first 250 m of the swim was the roughest start I had done. The field was very compact and congested and I had to maintain focus and calmness when I was pushed under water and disrupted multiple times. Around the first buoy, it settled, and I was slightly behind the lead athletes - which was different to where I would usually be placed. I took this it in my stride and focused on my catch, using the water, and a swim stroke cue that Steve and I had developed pre-race to help ensure that I hold a stroke rate of around 78 bpm. Yep I was good. Catching the lead athletes, the rest of the swim was about ensuring that I was swimming as straight as possible. Leaving the water in the first pack with 2 other athletes, we were quick into T1 and out onto the bike with the next group close behind. The two lap bike course was fast. The group close behind came together with my group and it ended up being a group of about 8 athletes in close proximity for most of the 20km bike and into T2. A quick changeover and I had racked my Merida Reacto DA in T2 and headed out onto the run well placed in the top 10. The run was a 2 lap course, with a slight undulation. At training, a focus has been on improving my run form and performance, which has been a weakness, and I can feel the improvement in the run each time I race. It was a tough run but it gave me the opportunity to focus on myself. My amazing coach on the sidelines helped me take the focus off my sore legs, and onto my form. Arms up, shoulders back and relaxed, focusing on rhythm and tempo, and light feet - which was easy to do with my light Brooks ST5 Racers. Perfect. A consistent run, and a near best time, I was thrilled to come home in the top 10 in the Open Female field. Former South Australian Sarah Crowley took out the win with a blistering bike and run performance. A massive thank you to my coach Steve O’Brien who has supported me through each and every race and training session over the last 2 years and has planned and travelled with me to every race of my first interstate season - which included racing in U23 National Series races in Queensland and Western Australia. 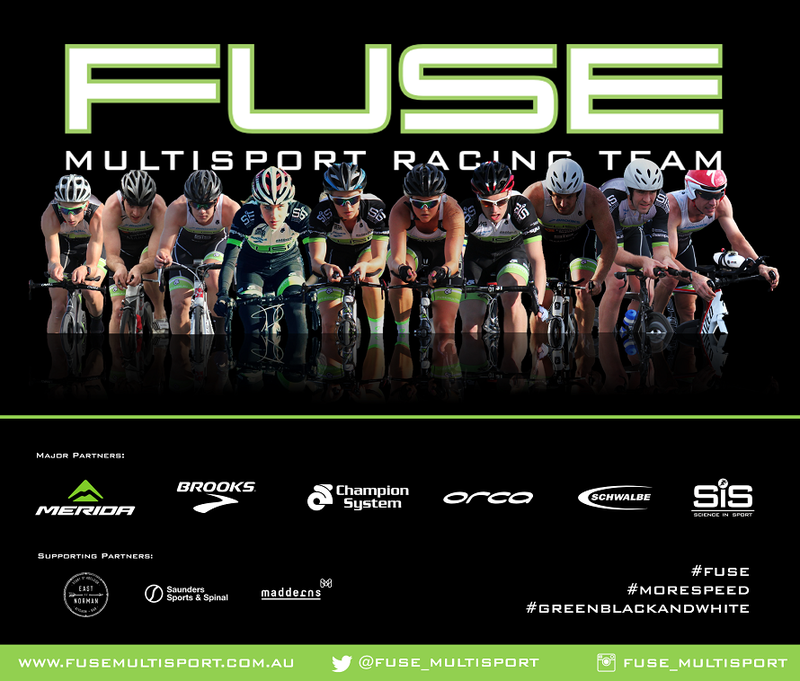 A big thanks also to all of my team-mates at Fuse Multisport. Our team is very privileged to have the outstanding and ongoing support of Merida Australia, Brooks Running Australia, Champion System Australia, Orca Australia, Schwalbe Australia, and Science in Sport Australia. A big thanks also to Madderns Patent and Trade Marks Attorneys, East of Norman and Saunders Sport and Spinal. I am also very thankful for the kind and supportive people I have met racing this year, who work in all aspects of the sport. I am very lucky to be participating in such a positive sport and doing what I love.